John Oliver has returned to the topic of opioids more than two years after his original segment on the crisis aired on his HBO series Last Week Tonight. This time around, the acclaimed comedy news host took a deep dive into how the dealings of a few massive pharmaceutical corporations precipitated the current epidemic. Of particular interest to Oliver was the recent testimony of former Purdue Pharma chairman Richard Sackler about how his company handled the distribution of the opioid OxyContin. Footage of Sackler’s testimony has not been made public, but Oliver did manage to get his hands on the transcript of the statement, which is pretty damning on its own. Combine that with dramatic interpretations by the likes of Michael Keaton, Bryan Cranston and Michael K. Williams, and Sackler comes across looking positively awful. Former Batman and multiple-time onscreen drug addict Keaton read the lines of Sackler’s testimony in which he blamed addicts for the opioid crisis and downplayed a state’s opioid death rate, all while sloppily eating a sandwich. Cranston returned to his role as meth kingpin Walter White to portray Sackler as an ominous villain, completely unbothered by Purdue Pharma’s egregious drug testing practices. Then, after Oliver remembered that “this is HBO,” the show was graced by a performance by Williams, who played Baltimore’s favorite stick-up man Omar Little in the drug-war drama The Wire. Williams read a line in which Sackler said he has “dedicated his life” to increasing the popularity of OxyContin. Oliver wrapped up the segment on a lighter note with an appearance from comedic actor Richard Kind, who gave voice to Sackler responding “I don’t know” more than 100 times during his testimony. 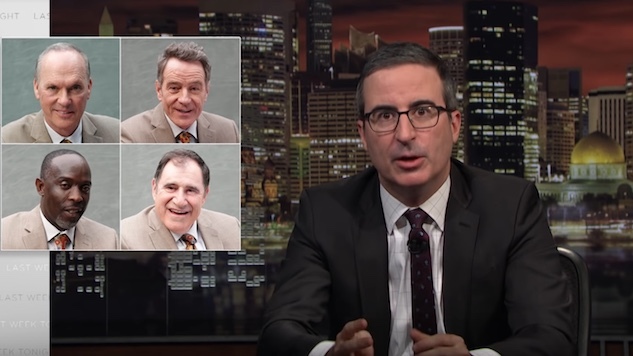 In typical Last Week Tonight fashion, Oliver decided to create a website with the full videos of the four actors’ performances along with records of state lawsuits against the company for everyone to see. The website is called SacklerGallery.com, referencing the public outcry against museums accepting donations from the Sackler family. Oliver ended on a call to action, telling Sackler that if he didn’t like how he was portrayed on the show, he should feel free to release the footage of his testimony himself and prove Oliver wrong. Watch the full segment from Sunday’s episode of Last Week Tonight below. The show airs Sunday nights at 11 p.m. ET/PT on HBO.